When most people think concrete, all that comes to mind is typically the boring grey slab concrete we are all used to seeing. However, the capabilities and customization of concrete have changed dramatically in recent years as companies such as Dirt Connections have innovated and expanded. Concrete is a versatile building material that offers a wide-ranging benefits. When deciding between asphalt or concrete paving for your facility or business, it is important to understand the benefits concrete construction can offer you. A number of benefits exist when choosing to use concrete for your company’s parking lot, plaza, or walkways. Below are just a few of the tangible benefits of paving with concrete. Modern concrete paving offers a wider variety of custom finishes and designs than would be possible with asphalt. Concrete walkways, sidewalks, plazas and even parking lots can be textured and colored to resemble a number of different stone textures and shades. Additionally, concrete can be stamped with patterns or formed into shapes, giving your home’s exterior a creative and unique look that will attract the eye with a bit of color and fun. Concrete is one of the most durable and cheap construction materials that exists. A concrete parking lot is easy to maintain and inexpensive to replace should it become cracked or otherwise damaged. Concrete’s durability makes it an ideal material for large parking lots or frequently used walkways. Whereas large, paved asphalt surfaces can require a great deal of upkeep and maintenance over the course of their useful lifespan, concrete areas can go decades without needing to be repaired or replaced. Additionally, when compared to asphalt pavement, concrete is more difficult for cars to skid on. Concrete is an extremely recyclable material and can be broken down and reused many times over for other construction projects. Additionally, by choosing a lighter colored concrete parking lot, plaza, or walkway, you can reduce your commercial facility’s environmental impact and utility bills. Black asphalt pavements absorb a lot of heat in summer months. The heat emitted from blacktop can in-turn heat your business’ interior, forcing your air cooling systems to work harder. By opting instead for light colored concrete options your business can greatly reduce its cooling bills and the amount of energy your facility requires to operate. When considering a business to partner with on your next commercial concrete paving project, look no further than Dirt Connections. We have the tools and expertise to handle all of your business’ concrete paving needs in a timely and professional manner. Below are just a few of the many commercial concrete construction and paving services Dirt Connections offers in the DC Metro area. Thinking of replacing or expanding your existing parking area? Dirt Connections is here to help. We offer both commercial concrete paving and asphalt services and years of experience handling large scale projects. We can help your company repair your lot’s problem areas, refresh faded markings, or build a new lot when business is booming. 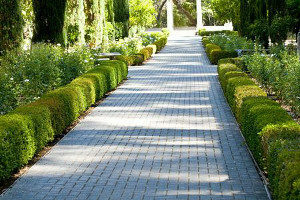 A finely manicured walkway or sidewalk leading up to your business will immediately draw the eye of customers. Decorative concrete finishes can offer your business’ entryway some added personality and flare that customers will be sure to remember. Having the appropriate drainage and water management systems around your facility is a solid way to protect your investment for years to come. Undesired water pooling can damage existing structures and unsettle your business’ foundation. 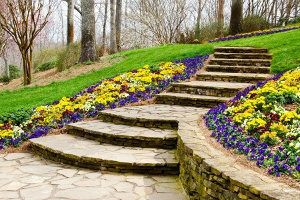 Dirt Connections has the expertise to design your curbs and gutter structures in a manner that best fits your site and location. 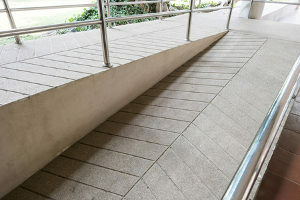 Also, we provide ramp building services to make your facility ADA approved and easily accessible. Here at Dirt Connections we are proud of our work and stand by everything we build. Our team of experts will be with you from day one helping you maintain your property and the concrete structures we build. Dirt Connections’ team of experienced contractors are ready to assist you with your next commercial concrete paving project. We offer a wide variety of decorative concrete options and can adjust to the demands of any project. Contact us today to find out how we can make your business’ next big idea a reality!